‘An evening with’ are informal events where established scientists with a connection to the MRC WIMM spend an evening with our students and staff, discussing their career and sharing their thoughts with the next generation of scientists. 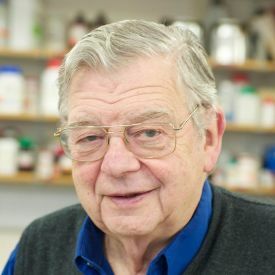 In this new feature in our blog, we interview the scientists who have kindly given their time to join this event, starting with Professor Sir Walter Bodmer, FRS, Emeritus Professor and Head of the Cancer and Immunogenetics Laboratory at the MRC WIMM and the Department of Oncology. You came to the UK at a very young age – your family had to flee Nazi-Germany and moved to Manchester. How did you decide to study Mathematics in Cambridge? When we moved to the UK, my parents were told to send their sons to the Manchester Grammar School because of its outstanding reputation and there I started enjoying doing sums. A friend of my parents who was a teacher said: “Look, if he is any good at maths, tell him to go into the maths sixth form!” That is what I did – and that’s how I ended up doing maths at school. It was then an obvious thing to study mathematics at University. I applied to Cambridge and got in. After your undergraduate degree, you did a PhD in genetics with Sir Ronald Fisher. How did this influence your career and led you to examine biological problems? David Cox, now one of the world’s most renowned statisticians, gave a very stimulating course in statistics as part of my maths undergraduate courses. Through this, I became interested in statistics and then chose to take classes by Ronald Fisher in my third year. 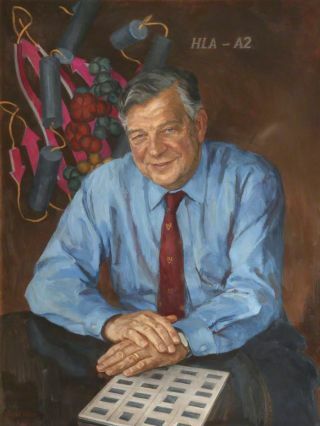 Fisher was not only one of the world’s greatest statistician, but also a founder of the field of population genetics and the applications of mathematics to evolutionary models based on Mendelian inheritance. In the summer before I started these courses I was given a few books to read, two by Fisher and also a textbook on Genetics. It was a totally new world to me – and I was fascinated! Within the first few weeks of my third year I went to Fisher and said: “Will you take me on as a student?” and he did! He was pleased to because he hadn’t had many mathematics students coming to work with him. He was in my view one of the greatest scientists of the 20th century. His scientific insights both in genetics and in statistics were quite remarkable and he had an absolutely profound influence on the rest of my career because that is how I got into genetics and biology. Fisher was insistent that if you did statistics, you needed to be involved in collecting your own data. So in spite of his largely theoretical background, he was very keen on getting one involved in experimental work. After finishing your PhD in 1961, you moved to Stanford University to join Joshua Lederberg as a postdoctoral researcher. Why did you make the decision to move to the US with your young family? It was becoming clear at that time that molecular biology was the thing to do in the future. Therefore, I decided that maybe I should do a post-doctoral fellowship in this area. Through Fisher I had got to know Francis Crick. Francis Crick introduced me to Max Delbrück, who was originally a physicist. Crick’s idea was that research with the former physicist might suit me well as a mathematically trained person. So I initially applied to work with Debruck through a Harkness fellowship. Fortunately - I have to say - I didn’t get it. I think this was because they didn’t believe that people with young families were good ambassadors from the UK to the United States. So I then took things into my own hands. I had heard about Lederberg, Nobel prize winner for finding out that you could do genetics with bacteria, who was then at Stanford. I wrote to him out of the blue and asked if he would take me on. At first he tried to put me off, but I persisted and said: ”If you can’t take me next year, what about the year after that?” He wrote back a letter, which I still have, in his own handwriting. It says: “Dear Bodmer, your persistence is flattering”, which I thought was extraordinary. And that’s how I ended up going to work with him. He was another absolutely outstanding scientist of the 20th century. Science always has its ups and downs. Looking back at your long and outstanding career, what do you consider your most important scientific achievement and your biggest disappointment? I would probably say that my most important impact was through my promotion of the opportunities that would be created by a Human Genome Project, namely obtaining the complete DNA sequence of the human genome. I gave an award lecture to the American Society of Human Genetics in 1980, emphasizing what could be done if we really knew what the genome sequence was and in particular the importance of knowing where genes are located. Until that time, people hadn’t realised that, through what became known as positional cloning, having found out where genes were located, you could then isolate, and sequence them and identify their function. That has been an absolutely fundamental part of the genomics era. In terms of specific scientific contributions, I would say my contribution to the early development of the HLA system (the gene system that encodes the major human histocompatibility system proteins), done in collaboration with my late wife, Julia. We first defined, in collaboration with Rose Payne, what is now called the A-locus of HLA by statistical analysis of complex serum reactions. That opened up a whole line of research that I continued with for a long time. My greatest disappointment – it is quite hard to say… but one of the things we did was the first genetic mapping of the APC gene, mutations in which underlie the Familial Adenomatous Polyposis Syndrome. We did this by mapping the gene to chromosome 5, and then found a fairly large deletion overlapping the relevant gene. This, unfortunately, made it quite hard to find the gene we wanted. Another two groups scooped us on that because they happened to find a smaller deletion to work with, so that was a bit of a disappointment. You are known to be an advocate for public engagement. You wrote a White Paper on this matter in 1980 for the Royal Society, known as the Bodmer Report, which is considered one of the starting points for science public engagement in the UK. Why did you write this report? My first experience talking about science to non-experts was as a graduate student at Clare College in Cambridge. They had graduate meetings where people used to talk about their own work. This was the start of my science engagement and there were various events later on during my time at Stanford that gradually got me more involved in public engagement. One such occasion involved William Shockley, Nobel prize winner for co-inventing the transistor. He promoted very strongly the argument that cognitive ability and IQ differences between major ethnic groups, notably black-African Americans and white Americans, were largely genetically determined. Joshua Lederberg was Head of the Genetics Department at that time and encouraged us all to co-sign a letter to Shockley showing our disagreement. I got involved quite heavily in that IQ and race argument and wrote a lay article in Scientific American with my colleague and friend of many years, the late Luca Cavalli-Sforza, arguing that there was no case for asserting that average differences in IQ between two such populations groups could be due to genetics. That lead eventually to John Maddox, who was then the Editor of Nature, asking me to join a committee of the British Association for the Advancement of Science. By the time I was asked to be the chairman of a Royal Society Committee for the Public Understanding of Science, I’d already been Director of the major cancer charity, the Imperial Cancer Research Fund, for a few years, and this role inevitably involved me in explaining to the public why they should support us doing cancer research. As chairman of that committee, which included amongst others, Sir David Attenborough, I was heavily involved in writing a report on the need for public understanding of science, or what later became known as public engagement. This report had a key influence on the subsequent support for public engagement of science activities in the UK at all levels. I do think this remains very important. The particular point we made was that every scientist should take some interest in explaining the work that they do. I think the report came out at the right time, and had a major impact. Nowadays everybody has, for example, to include public engagement in research grants, and that journey started with our report. Do you think there is still some work to be done in the field of public engagement? What could be improved? It never finishes. There is still the primary need for really good science and technology education in schools. I think getting the teaching right is vital and the public engagement of active scientists alongside it is also very important. Where else is the public going to find out about major scientific advances? It’s got to be from the scientific community. Of course journalists play a major role, but I think there is a responsibility for all people who work in science - at any level –to be willing to explain what they are doing and engaging with the public. You have worked with people with different backgrounds and from different scientific fields. How important are good working collaborations for a successful scientific career? I think they are essential. One of the nice things about the scientific career I have been privileged to have is that it is a community activity. If you run a lab, it is really important that your students and postdocs become your larger academic family. So I think personal relationships are extremely important and really that is the essence of good management – how you deal with people and how you get on with, and stimulate and encourage them. It is true in all aspects of life and is certainly true in science. Consider, for example, one of the most successful ever scientific institutions , namely the Laboratory of Molecular Biology. Max Perutz was the director for many years, and he was just an amazing master on how to interact with people He was able to create a community spirit, which I think is very important. What advice would you give to early career researchers looking back at your career? Most of all you should do what you enjoy doing. I think you should be adventurous and shouldn’t always worry about competition. You have to work quite hard, but you can enjoy work and play at the same time. If you are interested in Sir Walter Bodmer’s story, you can read more in “A Mathematician’s Odyssey” Annu Rev Genomics Hum Genet. 2015;16:1-29. doi: 10.1146/annurev-genom-090314-045856. Epub 2015 Apr 29. This interview was conducted, transcribed and edited by Laura Colling (Bodmer group). Image credit: Juliet Wood (with permission from Hertford College).